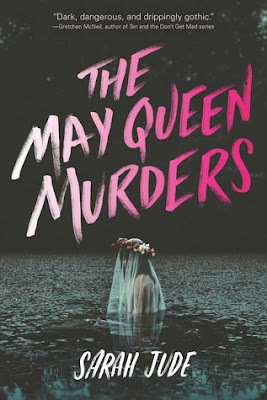 THE MAY QUEEN MURDERS by Sarah Jude is such thrill-ride! There's a serial killer on the loose and this superstitious lot of Rowan's Glen is blaming it on some urban legend about some crazy dude named Birch Markle, roaming the woods wearing animal pelt, lurking in the dark, waiting for his next victim. Thing is, Birch seems to have a taste for young girls with secrets and is known to strike during May Day. And this year's May Day brings a lot of terror with it from a string of murders, dumbfounding secrets, and a jaw-dropping conspiracy that you won't see coming. THE MAY QUEEN MURDERS is wildly atmospheric and dark, I won't be surprised if you get the heebie-jeebies while reading this. Rowan's Glen is the perfect place for this kind of story, their almost puritanic way of life and centuries-old traditions provided a fertile landscape to sow Birch Markle's legend to the point where I even considered he, or whoever the perpetrator is, might be a werewolf or some creature of the night preying on young women. Great review Braine, I love Missouri Ozark tales as I'm a Missourian myself! Gah! I must get my hands on this one, I love reading thrillers over the summer break! This sounds really good, so I'm happy that you enjoyed it so much! I love thriller/creepy novels so this seems perfect for me. I'm also happy it's a stand-alone. Oh it's so good! I never would've guessed the outcome. Ohhhh ... well, hello, I do believe I need this! Nice!! Cannot wait to read this one!! Got excited when I learned that the author is somewhat local! I love a good creepy mystery!! Glad it was spooky and surprising! Great review! Oh, sounds like a great story that would be right up my alley. Adding to my TBR list. I love the sound of this one, Braine. It's been awhile since I read something that gave me the heebie-jeebies! I want to read this one, but I think I'll wait a few more months. Glad you loved it! Dark AND a stand alone!!! I'm in! Gezz Braine this wasn't even on my radar and I wants it NOW!! That's different and sounds very interesting. Thanks for letting us know about this one. This would give me the heebie jeebies, but I like that once in a while. Great review! Oh wow! That's one great sounding book. :D Thank you! I just saw this book on Instagram today- glad you loved it! This kind of book has Melissa written all over it, lol, so I'll be sure to let her know about it. This one might be a bit too creepy for me, but I do like the sound of how atmospheric it is. Very few authors can really pull that off well. And I love it when a mystery is well written and has twists and turns you didn't see coming or some surprising revelations. Great review! This will thrill you I'm sure of it!